Here is a lesson that can be taught with any of the Curious George books. I incorporated this into an art camp that I taught called Feather, Fur, Scales, and Tales. 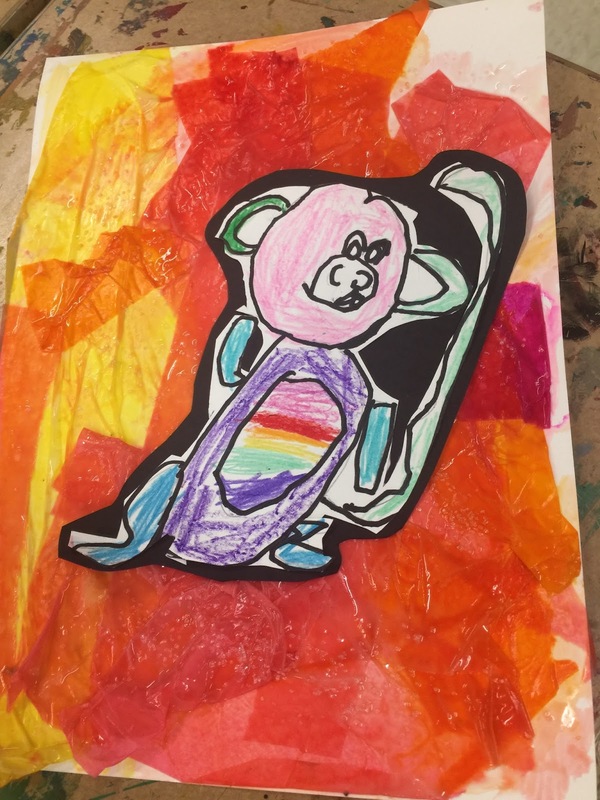 Each creation was based on a children's book with animal characters. I was teaching primarily Kindergarten and first graders. They had great difficulty drawing a monkey in the style of Curious George. So, we talked about shapes. I asked them what shapes they could use for the head, face, ears, etc. My favorite part of the shape discussion was that L/7 could be used for the arms and Z and backwards Z could be used for the legs. Be careful with the tail. If they do too much curling, they won't be able to cut it out. I say "one curl, you can draw one curl." I loop my hand around in the air to represent one curl. Otherwise they will draw around and around and around...OY! 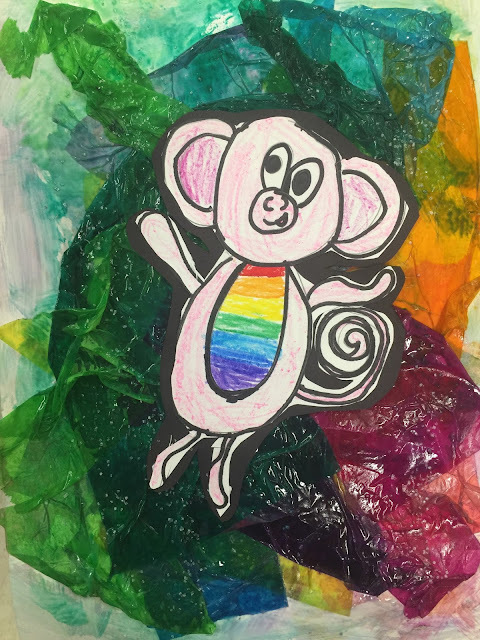 After they drew the monkey, they traced it with a black permanent marker and added color with crayons. Then, they cut it out. They glued it with regular glue bottles to black paper and cut around it to create a border. This was hard for these younger students. I had to help them a lot. I wish I'd made them trace a border and then cut on the line. I tried to get them to eyeball it. Didn't work. Don't do it. Make them draw first! These kiddos loved making this background. They used art tissue paper (the kind that bleeds). I actually had a bucket of scraps. It didn't take much of this to cover a sheet of paper. I am a stickler for making kids use glue bottles. It bothers me when art teachers (or any adult) makes gluing easy. I think they need to develop the fine motor skills needed to open, squeeze, and close a bottle of glue. So, I usually make them do this. However, since this is a little bit different from regular gluing, I squirted some glue, water, and glitter into a bowl. I stirred it up and let them paint the glue onto the paper. Then, they just had to place their tissue scraps. After they were placed, I had them paint the glue mixture over it one more time. That helps everything lie flat! You will probably have students who pile up a mound of tissue paper. Monitor for this and help them understand that some wrinkling in the paper is fine, but paper wads are not. I bet they haven't ever had to think about the difference before. Once you explain it and model it, they'll get it! Finally, I made sure that the students understood they were creating a monkey because they read Curious George. I talked to them about what "inspired by" means. In this case, we were inspired to create a monkey because of the book. Our monkeys don't have to look like the one in the book. 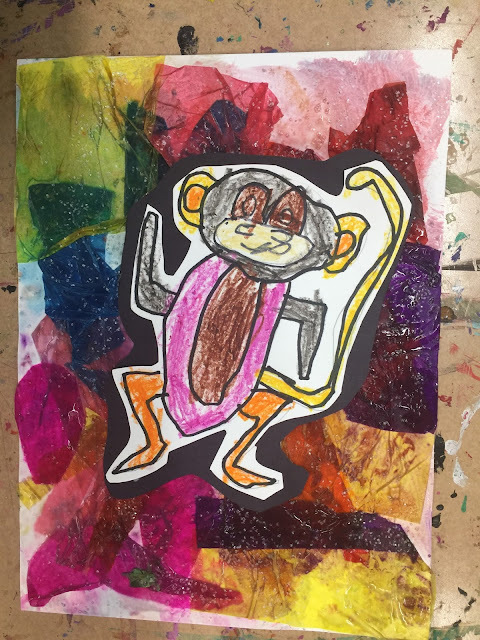 Have you ever taught an art lesson inspired by Curious George? Let me know the details.